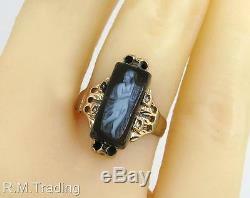 Antique Estate 9K Yellow Gold Hand Carved Black Onyx Victorian Ring. 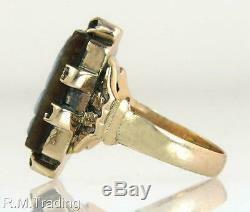 Featured for sale here is an estate antique 9K solid yellow gold black onyx Victorian ring!! 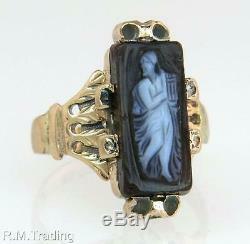 Fantastic 14 x 6.5 mm carved onyx gemstone in this hand crafted yellow gold setting! 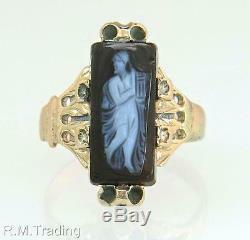 Onyx depicts a person in white with stunning detail! Hand crafted piece with classic Victorian design characteristics! 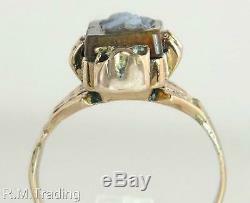 Stone is bezel set in the gold; stone is a little loose in the setting but it is secure. Made from solid hallmarked 9K gold. English hallmark indicate this piece was made in 1888 in Chester, England! The piece is in excellent shape after all these years! Onyx has small nicks and tiny chipping along the edges as would be expected for its age. Gold has some original patina. 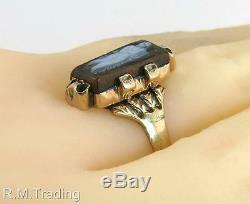 Ring measures 18 mm wide at the front and rises 7 mm above the finger. Victorian detail throughout make this a piece that will be treasured now and for generations to come! Thank you for shopping with us! We work hard to describe our items as accurately as we can. We attach large up close photos so you can make your own assessments. Condition, quality and grading of items varies by individual and these are our opinions. The gemstones and diamond in our pieces are all 100% natural unless we have stated they are not and label them lab created or simulated. The item in the photos are the actual item you will receive! We take our photos at a higher magnification than the naked eye, you may see things in the photos that will not be visible in person! Every computer monitor is different and the colors you see may vary from screen to screen. The dates and eras given are an approximation based on the style and design of the piece and are not guaranteed to be accurate. We do our best to grade the diamonds we sell. Grades are one persons opinion on that stone. Diamonds vary in all sizes and colors and while we try to get you the most accurate information we can, please know that this is only our opinion and someone else may have a differing opinion on the same diamond. The retail price we provide in only a tool to help you know the high price you could pay from a retailer. The approximate retail price we state is not an appraisal; we do not provide appraisal prices on the items we sell. You are the only person who can determine the worth of the piece. The item "Antique Estate 9K Yellow Gold Hand Carved Black Onyx Victorian Ring" is in sale since Saturday, April 22, 2017. This item is in the category "Jewelry & Watches\Vintage & Antique Jewelry\Fine\Victorian, Edwardian 1837-1910\Rings".trading" and is located in Dearborn, Michigan. This item can be shipped worldwide.